ShutdownTray 1.3.2 free download. ShutdownTray is an application that (from your system tray) allows you quick and easy access to all of your system's power options (shutdown, restart, hibernate, screen saver, etc). ShutdownTray can even be programmed to open at system startup to systray so that it's always running when you need it. ShutdownTray adds the ability to assign global hotkeys (key combinations) to each of the commands, so you can access any command with a single keystroke. If you are not on Windows Me, 2, or XP, you may need to download the Windows Installer Engine. ShutdownTray requires the Visual Basic 6.0 runtimes (MSVBVM60.DLL). LJConfig allows you to easily change the settings of supported Hewlett-Packard LaserJet printers from you desktop through any sort of printer connection. Lomsel Shutdown is a small system tool that can automatically perform various frequently used operations like shutdown or restart your computer, disconnect your current dialup connection, hibernate workstation, etc. Tray Plugin adds the ability to minimize Eudora (versions 3-7) to the Windows System Tray. Force shutdown is an easy to use time save tool, saving you from several clicks when you are finishing work with PC. Timed Shutdown will help you to automatically shutdown, restart, log off, disconnect or hibernate your computer. Shutdown, Power Off, Reboot, Log Off, Suspend or Hibernate -- all from a desktop shortcut or command line! Karen's Show Stopper allows you to create shortcut icons that quickly Shutdown, Power Off, Reboot, Log Off, Suspend or Hibernate your computer. HSLAB Free Force Down was created for fast and guaranteed execution of Windows Shutdown if there is a plenty of open programs. 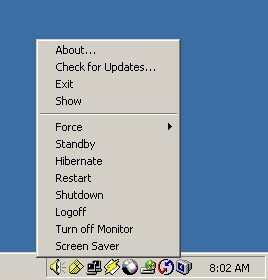 KinyonSoft System Manager software represents a freeware application that will provide easy/fast access to computer security lock, logoff, restart and shutdown options from your taskbar tray.